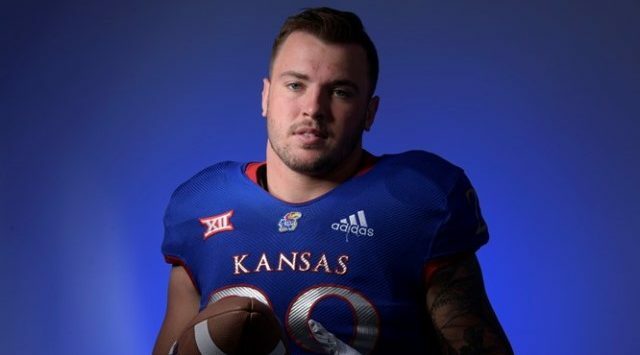 LAWRENCE, Kan. – Kansas senior linebacker Joe Dineen Jr. was named to The Associated Press All-America Second Team, announced Monday. Dineen becomes the first Jayhawk to earn AP All-America honors since Aqib Talib (First Team), Anthony Collins (First Team) and James McClinton (Second Team) earned nods in 2007. The announcement comes just days after Dineen was named Second Team All-America by Sports Illustrated for the second time in his career and after earning AP All-Big 12 First Team honors. Dineen, a Lawrence, Kansas native, led the Big 12 Conference in tackles for the second-consecutive year-just the second player in conference history to do so joining Texas Tech’s Lawrence Flugence (2001, 2002, 2003). Dineen turned in a career-best 147 tackles, which ranks sixth on KU’s single-season chart. His 12.3 stops per game in 2018 also ranks fourth in the FBS. For the second-straight season, Dineen led the FBS and the Big 12 Conference in solo tackles with 108 during his senior campaign. Dineen collected 11 tackles-for-loss in 2018, giving him a KU-record 45.5 in his career, making him both the single-season TFL record-holder (25.0 in 2017) and career record-holder. Additionally, Dineen’s 391 career-tackles rank fourth in Kansas history. Dineen was honored by the league coaches as a first-team member for the first time in his career after earning All-Big 12 Second Team honors in 2017. He was tabbed Big 12 Defensive Player of the Week twice during his senior season. Dineen is currently a Senior CLASS Award finalist. He was a Jason Witten Man of the Year semifinalist and a Lott IMPACT Trophy semifinalist after picking up its weekly award one time this season and being a weekly award nominee three other weeks. He was named Midseason First Team All-America by Sports Illustrated, an Academic All-Big 12 First Team honoree and a finalist for the Pop Warner Little Scholars Collegiate Player of the Year.